The availability of fiscal space has been at the centre of recent debates on the effective use of fiscal policy. This column introduces a new cross-country database of fiscal space indicators and applies it to the analysis of the evolution of fiscal space over the past quarter century and during oil price plunges. Fiscal space has weakened materially in many emerging and developing economies since the Global Crisis. Fiscal space tends to deteriorate in energy-exporting emerging and developing economies during oil price plunges but later improves, often because of procyclical fiscal tightening. The importance of a government’s ability to implement effective fiscal policy in the face of unexpected economic shocks was displayed prominently during and after the Global Crisis. This ability is based on budgetary resources available for governments to stimulate activity when needed (Nickel and Tudyka 2013, Huidrom et al. 2016). What does the new database offer? How has fiscal space evolved since 2000? What happens to fiscal space during oil price plunges? 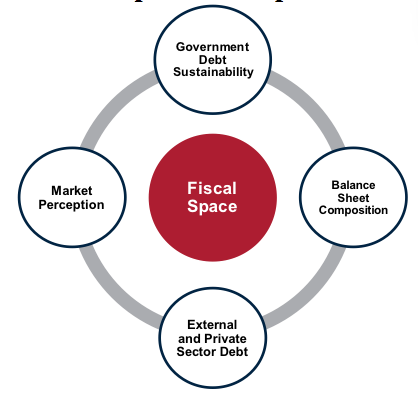 The new database brings together indicators of fiscal space along four dimensions: government debt sustainability, the composition of the government’s balance sheet, external and private sector debt as proxy of potential contingent liabilities, and market perception of sovereign risk as proxy of market access (Figure 1). The common aspect across these four dimensions is the ability of a government to service its debt. Unless debt service capacity is maintained, a government cannot indefinitely finance its operations in a sound manner. 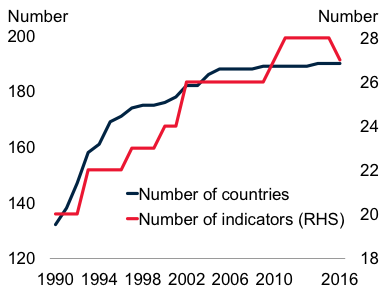 The database includes 28 indicators for a large number of advanced economies and EMDEs over the period 1990–2016 (Figure 2). Note: The numbers of countries and indicators available in denoted years in the database. Among the measures included in the database are sustainability gaps, which compare a country’s fiscal balance with the balance that stabilises government debt at a target level under different assumptions of output growth and long-term interest rates. For example, the debt burden of sustained fiscal deficits will be easier to service if interest rates are lower and growth is stronger (Buti and Carnot 2016). The sustainability gap indicator provides a simple snapshot of the adjustments that may be needed to reach debt targets under different conditions. A positive (negative) gap indicates that a fiscal balance would diminish (increase) government debt below (above) the target level, if sustained. Prior to the Global Crisis, in emerging market and developing economies (EMDEs) – and to a considerably lesser extent in advanced economies – fiscal space improved significantly as rapid growth reduced deficits, and helped reduce debt stocks (Figures 3A and 3B). In addition to robust growth performance, major debt relief initiatives contributed to the decline in debt stocks in low-income countries. In EMDEs, debt-increasing sustainability gaps during the global slowdown in 2001 by 2% of GDP turned into debt-reducing (positive) gaps of 5% of GDP by 2007. Note: Simple averages. Sustainability gaps are measured under current conditions. The year of the global recession (2009) associated with the financial crisis is shaded in gray. Since the crisis, fiscal positions have weakened in EMDEs. On average across EMDEs, government debt rose by 6 percentage points of GDP since 2007 to 53% of GDP by 2016, and fiscal deficits widened. Fiscal positions in EMDEs deteriorated in tandem with mounting private sector debt. Although the increase in private debt partly reflects financial deepening, rising private debt could impose fiscal costs during episodes of severe financial stress as private sector debt may become a contingent liability for the public sector (World Bank 2017). In EMDEs, pre-crisis improvements and post-crisis deteriorations in fiscal positions were most pronounced in resource-rich and commodity-dependent economies, in line with the cycle in commodity prices. In 2007, debt-reducing sustainability gaps set government debt on a firmly declining path. A sharp deterioration during the global recession of 2009 was reversed within a year. However, since the onset of the commodity price slide in 2011, fiscal sustainability gaps have steadily deteriorated in commodity-exporting EMDEs, and since 2014 have been materially below those of commodity importers. As energy exporters rely heavily on revenues from the resource sector, plunges in oil prices typically force them into fiscal adjustment and reserve losses (Danforth et al. 2016). By focusing on 36 energy-exporting EMDEs during the five major collapses in global oil prices, we briefly discuss how fiscal space evolve over such plunge episodes. Fiscal positions deteriorated sharply during oil price plunges in the past, but typically rebounded (Figures 4a and 4b). Within two years of these oil price plunge episodes, sustainability gaps were typically restored to their pre-plunge levels as a result of pro-cyclical fiscal tightening and recoveries of oil prices. From being debt-reducing in the year before the average oil price plunge, sustainability gaps worsened to debt-increasing levels of 5% of GDP one year after the plunge, as resource revenues declined. Two years after a typical plunge, however, sustainability gaps returned to debt-reducing levels of 4% of GDP. Note: Based on 36 energy-exporting EMDEs. Year t refers to the year of past oil price plunges. The solid blue lines are simple averages for all episodes, while the dashed blue lines show the interquartile range. The red lines are for the latest plunge starting in 2014. The new database constitutes a readily available, up-to-date resource for researchers interested in a wide range of fiscal issues. For example, it can be used to analyse the dimensions of fiscal space that are most relevant in assessing the effectiveness of fiscal policy. It can also help examine the relative importance of determinants of market perception indicators. Depending on the research question under consideration, the specific measure of fiscal space may well differ. It is impossible to identify a single measure of fiscal space that captures all potential fiscal constraints. Moreover, fiscal space could be affected by country-specific features, such as reserve currency status, credible monetary policy frameworks, and good governance. For country-specific analysis, one would also need to take into account other factors such as off-budget revenues or country-specific debt targets in addition to indicators featured in the new database. Authors’ note: The findings, interpretations, and conclusions expressed in this column are entirely those of the authors. They do not necessarily represent the views of the World Bank, its Executive Directors, or the countries they represent. The database is periodically updated and available at: http://www.worldbank.org/en/research/brief/fiscal-space. Abbas, S M A, N Belhocine, A El-Ganainy, and M Horton (2011), “Lessons from a Century of Large Public Debt Reductions and Build-Ups,” VoxEU.org, 18 December. Binder, A, P Mauro, R Romeu, and A Zaman (2013), “A Modern History of Fiscal Prudence and Profligacy,” VoxEU.org, 27 March. Bova, E, M Ruiz Arranz, F Toscani, and E Ture (2016), “Budgetary Surprises: Fiscal Costs of Contingent Liabilities,” VoxEU.org, 15 March. Buti M, and N Carnot (2016), “Fiscal Space and Low Interest Rates: A Eurozone Perspective,” VoxEU.org, 28 November. Danforth, J, P Medas, and V Salins (2016), “Fiscal Policy: How to Adjust to a Large Fall in Commodity Prices,” IMF How to Note 1. Huidrom, R, M A Kose, and F Ohnsorge (2016), “Under the Cloud of Cycles: Linkages between Fiscal Multipliers and Positions,” VoxEU.org, 13 August. Kose, M A, S Kurlat, F Ohnsorge, and N Sugawara (2017), “A Cross-Country Database of Fiscal Space,” World Bank Policy Research Working Paper 8157. Nickel C and A Tudyka (2013), “Fiscal stimulus in times of high public debt: Reconsidering multipliers and twin deficits,” VoxEU.org, 7 September. World Bank (2017), Global Economic Prospects: A Fragile Recovery, June.